A beautiful collection. Our excellent, knowledgeable guide made all the difference. She steered us through the crowds and maximized the time available. The weather cleared and we had two beautiful days in St.
Fabulous. Rooms & rooms of impressionist art. This is one of the wonders of the world. One could spend many days visiting St.
Would have needed a week to see even a small percentage of this museum, but this tour gave us a taste. Simply amazing. Great tour, great tour guide. Great tour, great tour guide. 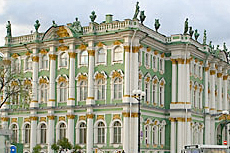 Hermitage Museum is incredible. You would need many more hours to even see one floor of it. The building itself is memorable besides the beautiful art work. Would love to return with more time. Very memorable but the Hermitage Museum was heaving with people and was extremely hot. Very memorable but the Hermitage Museum was heaving with people and was extremely hot. No water is allowed in there. We would not visit again unless it was in the autumn or spring. Half day was plenty for us. Half day was plenty for us. Guide was excellent at showing us the highlights of the place. On your own you&apos;d get lost! This tour was beyond all expectations. Incredible artwork from famous painters. Incredible artwork from famous painters. Beautiful gold leaf and gorgeous furniture. Hermitage at night is a must. Hermitage at night is a must. Absolutely no crowds, and guide was very knowledgeable. This was a decent tour. Very good look at part of the hermitage. Very good look at part of the hermitage. Fast! Not enough lifetimes to see amazing Russian art and historical artifacts. Took the Hermitage in the Evening tour. Hit all the highlights with an informative guide. Hit all the highlights with an informative guide. Allowed us 3 hours to walk streets which was great. An art lover&apos;s paradise … though I can only take so many paintings. An art lover&apos;s paradise … though I can only take so many paintings. Aside from the eyes in his characters, Rembrandt&apos;s works are dark and depressing. See what I mean by "I can only take so many"?